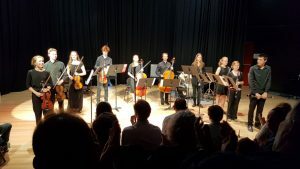 Launched in 2014, The Academy is a chamber music program for talented students across the Coffs region who have reached the equivalent of Grade 6 or higher in their instrument. Students come together on Monday afternoons during term time to rehearse for 90 minutes, covering a wide range of skills, music and topics. The Academy perform at least once per term at the Conservatorium and throughout the local region. Rehearsals are on Mondays from 4 – 5:30pm. How can I play with The Academy? Enrolment is by written application or by invitation. If you already have music lessons at the Con, your tutor may recommend you apply (or you can talk to your tutor about whether it would be appropriate for you). Artistic Director, Patrick Brearley directs The Academy and is always open to new enquiries. If you don’t have music lessons at the Con, please get in touch with us! We also work with music teachers across the region, asking them to recommend students for The Academy, so you may also like to talk to your school. Once you have applied, we will arrange an audition date with you. You will then need to prepare two contrasting musical pieces for your audition to be played solo, without accompaniment. What do I get from being a member of The Academy? Not only will you benefit from playing glorious chamber music with other musicians at a similar advanced level, you will also have the opportunity to work with the Con’s Artistic Director, Pat Brearley. And at various times during the year, students of The Academy are given first priority to play with touring artists in workshops and masterclasses at no extra charge. How much time will I have to commit to The Academy? Rehearsals for The Academy’s performances are 90 minutes per week, on a Monday afternoon from 4-5:30pm. The Academy is an exceptional opportunity for young musicians to benefit from tutors and performance opportunities you would usually only find in a university or professional musical environment. So, we expect students to do sufficient practice at home and attend all rehearsals in order to maintain their membership.